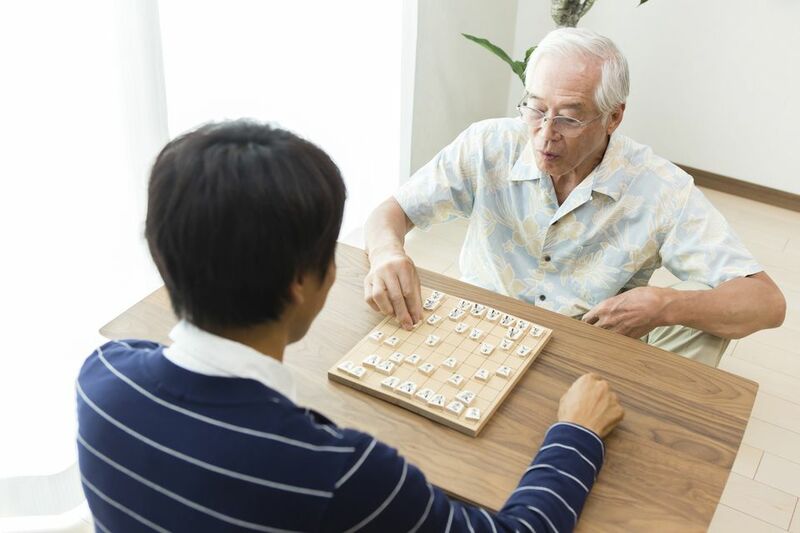 Shogi also referred to as Japanese Chess, enjoys an amazing popularity in its home country. But it's not limited to a Japanese fan base. Players around the world play Shogi. Josh Krekeler, the secretary of the U.S. Shogi Federation, wrote this primer for those of us who are Shogi novices. Shogi is the Japanese version of chess. While they share some common elements and strategic principles, they are really two different games. Shogi is much more popular in Japan than Chess is in America. Professional players compete for seven major titles throughout the year, and games are regularly broadcast on television. Some stations even sponsor their own Shogi competitions for the pros. Shogi owes its popularity largely to the excitement of "drops" -- instead of moving a piece on the board, you can add a captured piece to your army by dropping it on an empty square. Because of this rule, which distinguishes Shogi from all other established Chess-type games, most of the pieces remain in play for the entire game. Many games end in furious counterattacks where one tempo is the winning advantage. (A friend commented that it's a good idea to calculate the defense first in a Chess game, but the offense has a distinct advantage in Shogi. It's possible to disregard your opponent's attack if you can execute your own mating attack first). The object of Shogi is the same as Chess -- checkmate the king. The shogi board is 9x9 squares. Each player starts with a king, 9 pawns, 2 Gold Generals, 2 Silver Generals, 2 knights, 2 lances, a bishop and a rook. The pieces are all the same color because some of your opponent's pieces will soon be fighting on your side (and vice versa). The last three ranks on either side comprise the promotion zone, so promotion is common. Moves one square in any direction (identical to a Chess king). Protect your own, and hunt your opponent's without mercy. Castling is not accomplished in one move; it consists of moving the king into a position where it's shielded from the attack by a coordinated group of defensive pieces (when building a castle, it's a good idea to leave a "back door" escape route open). Moves one square in any direction except diagonally backward. Golds are very strong and good for defense but have limited mobility in the early stages of a game. Moves one square diagonally or straightforward, sort of like a "mini-bishop." Silvers are very flexible in general and move easily among pawn formations. When Silvers promote, they become Golds and lose their resemblance to bishops. Jumps two squares forward and one square to either side (think of a "T"). Shogi knights jump like Chess knights, but they only have two possible squares to move to, so they're not as valuable at the beginning of the game and must be developed with care. A knight that advances too early is easy prey for a pawn. A knight in hand, however, can be quite useful. Knights promote to Golds and must promote when they reach either of the last two ranks. Lances are like vestigial rooks. They start the game in the corners of the board and can move forward as many squares as they are able. They're restricted to their file, though, and can't move backward. Lances play an important role in edge attacks, but often they don't do anything else until they're captured and dropped. Lances promote to Golds and must promote when they reach the last rank. Pawns move and capture one square straight forward. They don't protect each other diagonally, so you can't build pawn chains, but a row of pawns supported by a Silver or Gold behind them can make an effective "wall." Pawns promote to Golds, and promoted pawns ("tokins") are especially useful because they're as powerful as Golds on the board. However, once they're captured they revert to simple pawns. Moves an unlimited number of squares diagonally, like a Chess bishop. There are only two bishops in Shogi, and they start the game pointing at each other, so each game begins with the possibility of a bishop exchange. A promoted bishop is a horse or "king-bishop," which combines the moves of king and bishop. Moves an unlimited number of squares orthogonally, like a Chess rook. The rook is the root of most opening attacks, and Shogi openings are generally classified according to where the rook is positioned in the first few moves of the game. Promoting the rook is an important achievement because of a promoted rook, or dragon is very powerful and can do a lot of damage to the opposing camp with the right support. A dragon is a "king-rook," meaning it can move as a rook or one square diagonally. New Shogi players don't have to worry about losing every game they play against a more experienced opponent, because Shogi has an established handicap system designed to teach beginners how to develop an attack. The more experienced player removes two pieces (rook and bishop), four pieces (rook, bishop, and lances), or six pieces (rook, bishop, lances, and knights). For his trouble, he gets to make the first move, which is a smaller advantage than the first move in Chess because there's more distance between the armies on a Shogi board and only the rook and bishop have significant long-range power. The best way to learn Shogi is to find a player in your area and play a lot of games on a physical board. In Europe, it seems you can't throw a Go stone without hitting a Shogi player these days. In America, there are active shogi clubs around Cincinnati, Los Angeles, Waikiki, Chicago, Seattle, Washington D.C., and New York City. In Canada, Vancouver and Ottawa-Hull have Shogi clubs. If you're not in one of these areas, you can also send a query to the Shogi Discussion List. If you still can't find a Shogi player in your vicinity, I recommend asking around at local Chess clubs and contacting a Japan-America Society or a university's Japanese or international club. If there aren't many (or any) other shogi players around you, I encourage you to teach a few friends and start your own club, which is easy to do once you introduce someone to the brilliance and beauty of the game. It's good to supplement over-the-board instruction with independent study. There are three English Shogi books currently in print that I know of: Shogi: Japan's Game of Strategy (Trevor Leggett), Shogi for Beginners (John Fairbairn) and The Art of Shogi (Tony Hosking). Leggett's and Fairbairn's books are written for new players. I found Shogi for Beginners to be the more useful of the two. As for The Art of Shogi, it's not an exaggeration to say that it's essential for any English-speaking player who's serious about shogi. Amateur players of any level will find a lot of rewarding material there. It's available from the publisher's website. Many thanks to Josh Krekeler, secretary of the U.S. Shogi Federation, for writing this introduction to Shogi. If you'd like to reach Josh, send email to joshxles@one.net.